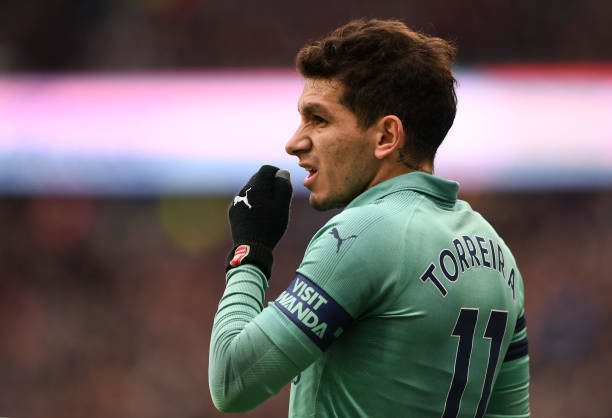 Arsenal’s midfielder Lucas Torreira will probably be in the starting eleven that faces Rennes and he has revealed the secret weapon of the gunners ahead of this match. Lucas Torreira will not be in Arsenal’s match day squads in its next two Premier League matches because of the red card that he received in the North London Derby but he will however be eligible to play in the UEFA Europa League because that, red card doesn’t affect the European competitions. The gunners will on Thursday face Rennes and it will be a match which will determine whether the North Londoners continue with their European journey or see it get stopped by a club which is in the eighth position on the Ligue one table. Arsenal will come into this match with a deficit of two goals because Rennes defeated them 3-1 in France last week. Lucas Torreira will probably be in the starting eleven that faces Rennes because he will be fresh after having the weekend off because of his ineligibility to play in Arsenal’s 2-0 win over Manchester United but his services will be needed tonight. Lucas Torreira has said that Alexandre Lacazette will be their secret weapon in this match and reveals that they all hope that the Frenchman can get them a good result over Rennes in today’s match. “We all know how important Alex Lacazette is to us as a group and obviously the more players we have available, the better it is because we do have some quality players, particularly in midfield and up top.” Lucas Torreira told Arsenal Media. Lacazette was previously going to miss both of the Rennes matches but UEFA later confirmed on Monday that the Arsenal striker will be able to play the match against the French side. Lacazette’s return to the Europa squad is a huge boost for Unai Emery and the whole squad because he has so much to offer on the pitch.